An innovative family literacy project in Timor-Leste supported by ChildFund, is encouraging children and their parents to read and learn, together.. 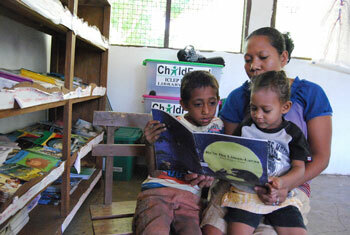 In Biqueli Primary School on Atauro Island, Timor-Leste, the books that line the shelves are not gathering dust. Instead, the school library is a place of near-constant activity, even during school holidays. Since Biqueli’s school participated in an innovative family literacy program in 2011, many parents and children visit the library once or twice a week to read together. The family literacy project was piloted at the school in 2010 and 2011 as part of a comprehensive program that included working with local parents and teachers to repair the school roof, distribute library books and establish an after-school reading club. The project used interactive exercises such as drawing, storytelling, games and competitions to demonstrate to parents and children the value of learning together. Over 11 months, parents met twice a week with ChildFund-trained facilitators to participate in activities based on local traditions and designed to impart basic literacy and numeracy skills. For many of the parents, it was the first time since leaving primary school that they had had a chance to continue their educations. Josefa, a mother of two, is one of 31 parents who completed the family literacy curriculum. “The program helped us to help our children at home with reading and writing,” she says. Rince adds that she and her husband have already noticed the improvement in Jimmy’s learning. “There has been a difference since I started teaching him,” she says. “My husband also realized the change. If he has time, he teaches Jimmy, but if he is busy, I teach him.” Rince plans to do the same for Jintara when she starts school. The family’s weekly visits to the library have clearly caught the toddler’s interest — she flips eagerly through any book within her reach. Many families in Biqueli now have an established daily routine of learning together and plan for their children’s continued education at high school and university. Despite her own limited education, Rince is determined to see Jimmy and Jintara succeed. “I want my children to grow up and have a better life and find better work than their father has,” she says. Until then, Rince intends to continue the family’s routine — one hour, every day.